Dentures are constructed to replace missing teeth. 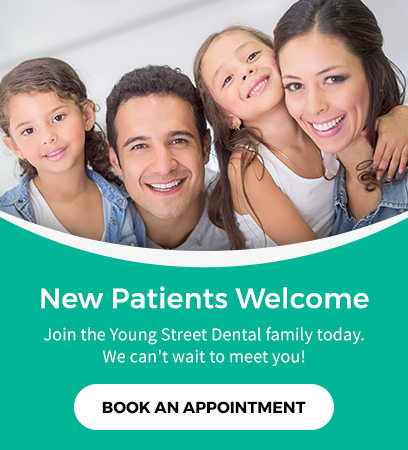 Our dentists at Young Street Dental in Chilliwack can get you fitted for dentures today! A denture is a removable dental appliance. It is used to replace missing teeth and the surrounding tissue. They are made to closely resemble your natural teeth and enhance your smile. Dentures are durable, but may have to be remade, repaired or readjusted after a few years due to normal wear to correctly fit in your mouth. Complete dentures are used when all of the teeth are missing. A complete denture can take between 6 to 12 weeks to complete after establishing your full dental structure. Partial dentures are used when some natural teeth remain. It fills the spaces caused by missing teeth and prevents other teeth from shifting. If you are interested in complete or partial dentures, contact us today to book a consultation.